After first voting on July 9 to abandon efforts to secure funding for an early phase of restoring the Superior Portland Cement Company Administration Building, the Concrete Town Council agreed on July 25 to let two advisory groups pursue funding opportunities. 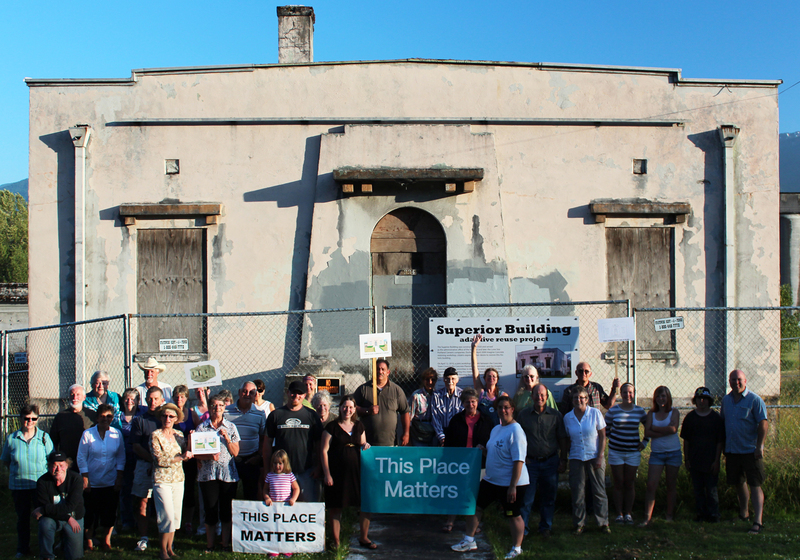 The council’s second July meeting was attended in large part by local citizens who were frustrated by the council’s initial decision, which seemed to open the door for demolition of the Superior Building after three years of town and citizen efforts to save it. During the July 9 meeting, council-members David Pfeiffer, Jack Mears, and Mike Bartel voted to deny a resolution presented to them by the Historical Preservation and Landmarks Commission (HPLC), an advisory body that the previous council had voted into existence to help guide and inform the Superior Building’s restoration. About 20 people attended the July 25 council meeting to protest the council’s earlier decision. Among them were Bruce Newburn and Judy Fales, who live near Concrete. Newburn presented the council with 120 signed petitions in support of saving the building. The three dissenting council members were not convinced by the remarks from the public until John Boggs took the stand. Boggs suggested an approach that would allow the town to remove itself from the fundraising effort, placing that responsibility with the Imagine Concrete group and the HPLC. Since The Johnson Partnership principal Larry Johnson had said the building probably wouldn’t be salvageable three years from now, Boggs suggested a deadline could be set, giving the groups three years to secure funding for a permanent roof for the building. All five council members agreed to the approach Boggs suggested, so a revised resolution will be drafted, directing Imagine Concrete and the HPLC to seek out funding for the building’s permanent roof. The two groups will have until Dec. 31, 2015 to have the roof installed; if that deadline is not met, the restoration of the Superior Building will be reevaluated by the council. The council will vote on the new resolution during its Aug. 27 meeting. Already, fundraising efforts have begun. The Imagine Concrete Foundation is working to create an account at the Concrete branch of Columbia Bank with which to receive donations. Fales coined the phrase, “SOS,” which stands for “Save Our Superior Building.” The slogan likely will be used for future fundraising efforts. The Superior Building was constructed in 1920 and a basement laboratory was added in 1923. The building’s restoration was one of the more popular ideas to come out of the first Imagine Concrete visioning workshop in April 2009. Since then, the town authorized the creation of the HPLC and approved efforts to become a Certified Local Government. Both decisions were made with the restoration of the Superior Building in mind. Concrete citizens and area residents gathered at the Superior Building in Concrete July 11 to show their support for saving the building. The move was in response to the Concrete Town Council’s July 9 decision to stop pursuing funding for the building’s restoration.